If you are a chocolate-lover, here’s a recipe for you to try! This Chocolate Zucchini Snack Cake is a cross between a cake-like brownie and a chocolate cake. It’s so simple, it just has semi-sweet mini chocolate chips sprinkled on top instead of frosting. The zucchini makes the cake so very moist–and I think it’s amazing that you can’t even tell there is any zucchini in this! The mini seem-sweet chocolate chips make this cake extra chocolatey, too–there’s lots of chocolate chips in the batter and more on top of the cake. It has plenty of chocolate, so you don’t even miss the frosting! Everyone I shared this cake with really liked it, so I think this recipe is a keeper! Preheat oven to 350˚F. Grease and flour a 9×13″ baking pan or line with parchment paper. In large bowl, cream butter and sugar until light and fluffy. Add eggs, mixing well, then add in yogurt and vanilla extract. In medium bowl, blend the flour, cocoa powder, baking soda, and salt. Stir the flour mixture into the butter/sugar mixture. Fold in the shredded zucchini and mini semi-sweet chocolate chips and mix until evenly distributed in batter. Spoon batter into prepared pan, spreading evenly in pan and bake at 350˚F for 35 minutes or until toothpick inserted in center comes out clean. Remove cake from oven and sprinkle the top with the additional mini chocolate chips (the chips will gradually get soft and melty as the cake cools). Let cool completely, then cut into squares and serve. After my last 3 zucchini recipes, I still have a little more zucchini left! Probably just about one cup’s worth. So I may post one more zucchini recipe…we’ll see! Linked to Fiesta Friday, Meal Plan Monday, Inspire Me Monday. This entry was posted in Cakes/Coffe Cakes and tagged Cake, chocolate, zucchini on September 2, 2016 by nancyc. This is a good, easy cookie bar recipe that I’ve had for quite awhile! I think I originally found it in a magazine ad and then I came across it later at Kraft Recipes. This recipe uses a cake mix as part of the ingredients for the yummy chocolatey crust, so it’s simple to put together. I usually prefer making things from scratch, but sometimes a mix comes in handy if you’re in a time crunch. And these bars are so good you may not mind that they’re made with cake mix! My version of these bars is a little different from the original recipe–I usually use pecans instead of walnuts (this time I used a little of both), dark chocolate chips instead of chocolate chunks, and regular chocolate cake mix instead of German chocolate. When you’re in the mood for a very chocolatey, chewy, caramel treat, this is a great recipe to try! Save some time by unwrapping the caramels ahead of time before you make these! Preheat oven to 350 degrees. Unwrap caramels and melt them with 1/3 cup of the evaporated milk in a saucepan over low heat, stirring frequently until caramels are completely melted. Remove from heat; set aside. Mix remaining milk, dry cake mix and melted butter in a large bowl. Press half of the cake mixture firmly onto the bottom of a greased 13 x 9-inch baking pan to form crust. Bake 8 minutes, then remove from oven. Sprinkle 1 cup of the nuts and 3/4 cup of the dark chocolate chips over the crust. Drizzle evenly with melted caramel mixture. Top with teaspoonfuls of the remaining cake mixture; press gently into caramel mixture with back of spoon. Sprinkle with the remaining 1/2 cup of nuts and 3/4 cup dark chocolate chips. Put back in the oven and bake an additional 16 to 18 minutes or until lightly browned. Cool completely before cutting into bars. Note: if you want to eat these warm (they’d be great with some ice cream on top!) wait about 20 to 30 minutes before cutting them so they won’t be so gooey. For less gooey bars, wait about an hour before cutting them, when they’ve cooled more. Be sure not to wait more than a few hours before cutting them; if you do, they will be harder to cut since the caramel and bottom crust will harden some. It may be a little tricky to get your first piece out of the pan without crumbling it a bit, but once that’s out, the rest of your bars should come out easily! The combination of dark chocolate, nuts, and caramel is so good! What’s your favorite chocolate/caramel dessert? Linked to Fiesta Friday at The Novice Gardener, Inspire Me Monday at Create with Joy. This entry was posted in Cookies/Bars/Brownies, Food and Recipes and tagged caramel, chocolate, cookie bars, Dark Chocolate, dark chocolate chips, dessert, featured, pecans, walnuts on August 8, 2014 by nancyc. Sometimes I get the greatest recipes when I’m in the lunchroom at work! 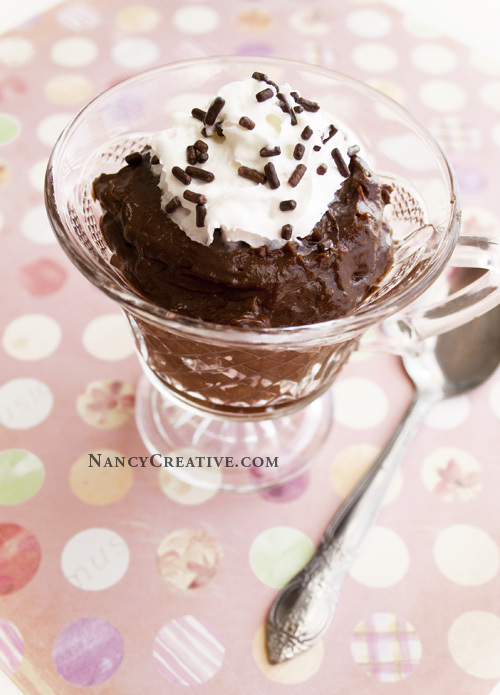 Like this Avocado Chocolate Mousse. I got the recipe from Robin, who has a blog of her own. She was telling me about a health and nutrition event she went to where they were preparing recipes with healthy ingredients and this Avocado Chocolate Mousse was one of them. I love avocados, but avocado and chocolate? Robin assured me that this mousse tasted like a creamy chocolate truffle and she was right! Combine all ingredients in a food processor and process until smooth. Refrigerate until ready to serve. Top with light whipped cream and chocolate sprinkles, if desired. Note: This can be made the day before you serve it. You don’t really need to add the whipped cream or sprinkles because this mousse tastes great all by itself–but it does make the dessert look a little cuter! Have you made any dessert recipes using avocado as an ingredient? This entry was posted in Food and Recipes, Healthy Eating, Other Desserts and tagged Avocado, chocolate, chocolate avocado mousse, cocoa powder, dessert, healthy dessert, honey on February 28, 2014 by nancyc.